All I’m getting is a bunch of Nordic blonde people in a room holding up some kind of weapon to use in their next invasion of their neighbors to the south. This was a joke, by the way. Please don’t pillage my village! I understand the language, believe me, it’s more than a bunch of Nordic blonde people there. The IQ quantity on square meter is very high in that room. Dragos: I understand the language, believe me, it’s more than a bunch of Nordic blonde people there. The IQ quantity on square meter is very high in that room. And it looks like each one brought in their own HP calculator and lined them all up on the table! Wow. They obviously knew your “go button”! I would guess that the priceless array of aged HP calculators there was worth, what? You’re way off the mark. They are priceless! Do you think the OLPC XO laptop will get such a following? The reason I ask is because they go against the one thing technology abhors: a computer experience that has the power to never change or can last forever with replaceable parts. A MANUAL TYPEWRITER ON LINUX! If a person gets an XO laptop and spare parts from the gazillion that are around, he could have a lifetime system that will never need upgrading and have an endless supply of parts that he or she can use. a short summary too written in a way that a laywoman could understand it too. So it’s like a motor cycle gang? Sorta. Only we are nicer. And geekier. And fewer. Well. From what I saw in that video, I wouldn’t want to piss you guys off on the highway! Did you check out the end where they gave us the calculators? I did and it looked so fun! Were you quite surprised? Yes. The many hours of tone scale drilling that I have done say that the room was infused with 3.5 Cheerfulness, and then shot up to 8.0 Exhilaration. It was actually very funny. I laughed quite a bit. Christmas obviously came early for you. I’ve got a freakin’ HP-70!! And it’s working!!! Chris, I was VERY surprised. I could have expected one old calculator and most likely one I already had in my collection. But 12?? And among them was an HP-70, HP-25C, HP-27, HP-10, HP-25, HP-21, HP-22, HP-80… even a utilities module for an HP-71B! WOW. LOL! Even OSA will get this! Who got the roses after you? 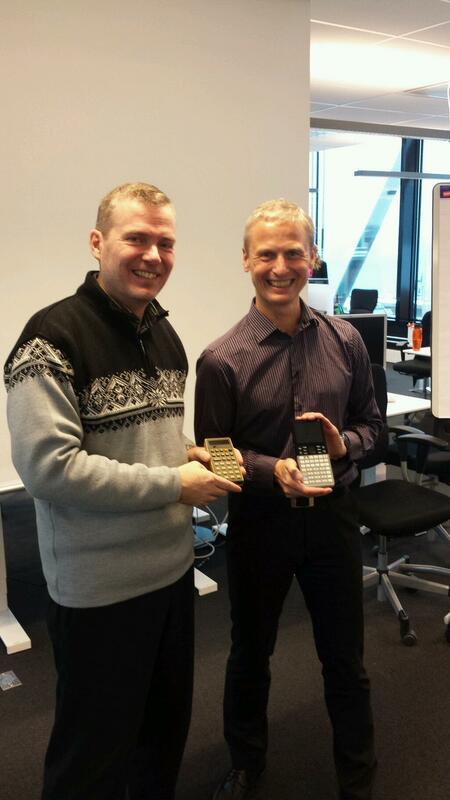 Geir, how many HP calculators do you have in your personal collection? 20, 30 or more? Are you also interested in Texas Instruments or Casio for instance? There were competitors in the 80’s. sparkles that can then manifest as whatever in human life. Wait a second! Please be more specific. What exactly means a “small place in your heart”? That means you love TI’s or it means almost nothing for you compared with HP? The same with Casio? If HP scores a 10 on my interest scale, then TI scores 4 and Casio 2. I have all of them. both the 32S II and the 17B II are good calcs. Never owned a 33s. It’s the weirdest design of the HP calculators. Ok, and others I asked you above? The TI-59 is an amazing machine in that you could make self-modifying programs on the (AI-type programs). I did that back in ’79 as I made a sort-of IQ test that modified itself. Cool stuff. The reason it could be done was that one could, during a program run, decide how much memory was allocated to program steps and how much was allocated to registers. By letting the program write numbers to some registers and then converting those registers to program steps, a new program was made, etc. This trick could be done also earlier with a predecessor, the SR-52. I had. It was caught in the fire. Looking for a new one. Excuse me?…How could be caught in the fire? Were you nervous or something? My calculator collection of 89 calcs went up in smoke 12 August 2008 when the whole building where we had our offices burned to the ground. 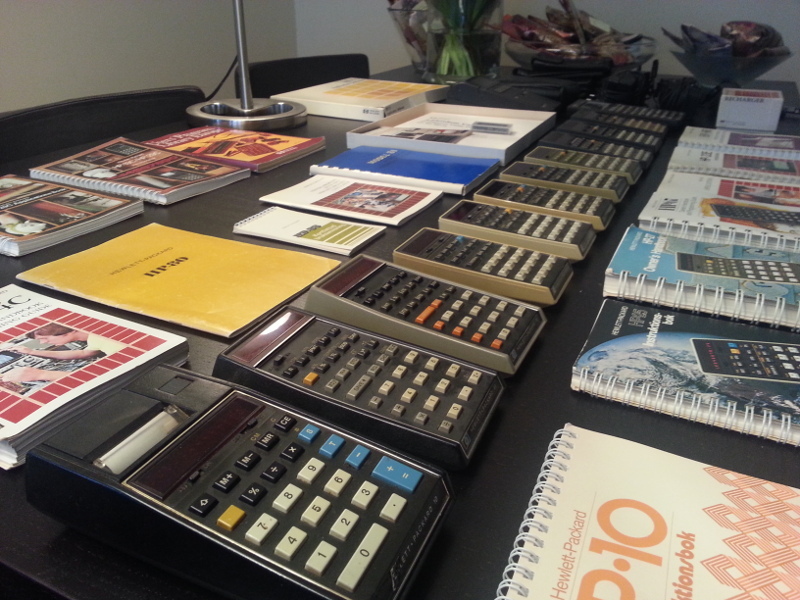 The 90th calc was at home (his name was Julius – an HP-41CX). Whoah Geir! Whoah! I’m surprised, flabbergasted in fact, that of all people, YOU didn’t know! Yet the actual, unsuspected “cause” of the fire, is sitting there, smugly, right at the end of your post (@ 22.27) !!! Okay, okay, no ribbing necessary, just please let me finish! Let’s just try assemble things THIS way, to see if it fits, huh? ….So then,…. 89 (eighty-nine), of the prized collection, get to garner admiration, and display their almighty, wondrous, capabilities, to who -knows-who, in ‘THE” Building! ….. And a little old HP-41CX (named Julius!) just “coincidently”, number 90 (ninety), (has a nice ‘news-worthy’ ring to it, yeah?) who ‘just’ happened to be (“left”) at home (make that – ignored!!! ), was the ONLY survivor of the fire ??? Mebbe, a re-examination of Julius’s ‘actual capabilities’, will reveal something you didn’t even suspect?? you sure know how amazing you are….this song popped up, no reason why, sending it to you….there is a line in it ‘we are neighbours at heart’…. like this, can you pick it up? Yes, my deah. Subtlety is far more delectable, enticingly so, what? You know, channeling this type of energy and raw passion, over cyberspace tends to ignite one in the most extraordinary places. (‘clip over heard and recorded of HRH the Prince of Wales.) — Top that, MT? HaHa…perhaps but I would rather not do it. Geir almost succeeded in getting the blog ‘fluid’ on several occasions in the past. If we top it, in the space of infinite possibilities even the last particle of illusionary personal control would disappear. like joining this party? Calvin, you are hilarious…. Alright M, it’s Sunday a’noon, feelin’ the effects of a more that adequate lunch overload, plonked down in front of the box, and decided to get thoroughly intoxicated! Not the usual way, though. This time, via a tankard FULL of theta! A 2-hour special on Andrea Boccelli, courtesy of master pianist/presenter David Foster, in spectacular Porta Fina, a fishing village, in Genoa, Southern Italy. ( you see, M, I found myself needing a little de-dinging from an O/D of ‘reverberations’ of monastic bell gong-g-gg-g-ing, per your ladyship’s invitation, by which I shall ALWAYS remember you, most assuredly!) For two hours, transported into that magical place, ‘Heaven,’ for want of a better description. It’s poignant to say, that there is just so much raw admiration, and total appreciation, in the faces of all those performing, and the vast audience, and he, Andrea, never gets to actually SEE that, ever. David Foster, was moved to say;… ” If God had a singing voice, he would sound like Andrea Boccelli. ” …. I found myself agreeing…. I have recently posted that many years ago through chakra breathing I saw the Universe as it is….not only saw it but heard its sounds as well. Impossible to describe it with words. The Tibetan bell….I forgot to tell you that if you sit…just sit, closing your eyes, you can feel its vibration….feel….all over your body and mind…if you open your hands, you can feel the vibrating connection with the universe at the tips of your fingers….it is, like the Tibetan singing bowls, the closest to the purest vibrations….also the sound…..
it, when one is speaking out of one’s basic valence, you can hear it in the voice. Thanks Calvin for your honest origination. I get it more than you can imagine it. comment. Can you see them? far did you get with it? Thanks for the acks, Marianne, they are genuinely appreciated. Just to clarify, I normally operate on “full alert,” which is standard requirement for the actual threats I have to face on any given working day. Getting too laid back & “comfortable”, impairs that focus & alertness, and naturally it’s a schlepp to get back to that state of readiness, you need, to be on top of your game. So, yes the solution/remedy is self explanatory, as you pointed out! Thanks. Need to turn in now, for a decent battery charge. ‘Nite, all. I will leave you with this…you may listen to it as relaxation during the day….good night. I’ll stop there, I think you get the picture. ( You’re obliged to look after the whole package.) MEST bodies definitely DO influence one’s capabilities, to a certain degree. (even necessity levels can be exhausted too!) I have found ( yet again!, much to my embarrassment), that it’s just a no-brainer. to allow one’s self to slump off into the excesses of comfort, and/or inebriation, (in any shape or form) at the expense of (meaningful) “motion”, in the physical universe. For me, personally, it’s like giving myself a resounding slap across the face, necessarily making it sting!!! After all, as a former gym owner, bodybuilder/ power lifter/ nutrition counselor, isn’t that the whole point to that existence? ps. All the advice you have given freely, and with great concern, is anything but wasted, OK? Just two days ago, a great personal friend, a “mentor” of usually tigerish demeanor, shouted after me, walking away from the local mall! Now this is someone who always carried enormous influence on those around him, (as a former Scn, trained up to class IV, and OT IV,) and let me tell you, this guy “is” as tough, as you can find anywhere. Anyway, so I stopped and let him catch up with me. Long story shortened, he had lost a lot of weight, and as a result, energy, and looked a shadow of his former self. Basically, he had stopped on the ‘create-create-create’ (survive, persist) postulate, and gone onto a counte -create postulate! (No motion = discontinuance of the usefulness of the body /organism.) Thankfully, he is not so pig -headed, to recognize he needed help, and asked for it. After half an hour straight 2-way comm, we had straightened out what had led to the physical slump in his life, (essentially USE it – or LOSE it!) and set up a physical exercise program, radical overhaul of his diet, and a muscle building supplementary food stack, to get him back, to where he needs to be, to “re-create.,”some of the zest and shape that he was used to. He checks back in to me in two weeks. You get a HUGE pass! YOU tell me WHY!!!! Geir, you KNOW you can HAVE, after the silly-season is spent, silly! The “centre” of Geir’s ‘physique-al’ universe doth protesteth too loudly, to pay attention, right now! We pick up this conversation, when it’s all over, capiche? That stupid idiot who started in scio circles that the body is not precious! That every bit of it cannot be enjoyed for what it is! The body also has a frequency-vibration, thus it is part of the human-beingness. Thanks for the mirror-reminder…I also tend to care a bit less for my ‘body’ and ‘motion’ than I should. I care, every day but not as much as I would like to. I ‘scan’ and perceive it all over, inside-outside and feel it OK. I am moving fast with it, OK.
being all right. Work. Rush. Work…. Pssst, that’s all fine sis, really! Now ….just….relax….take it easy. That’s it. We get it all when we just quieten down the hubbub of the village market, in our hedz, and just listen. Hear it now? Ah! The exquisite beauty in pure beingness. You got it… all. Hi M, say, i really like the applied “Julia” look. It suits you, really does! In the days when I still had the gym, we had a window sign, 20 meters long, rigged to draw attention from passing motorists: ‘When YOU look good, you FEEL good!’ It worked! Wow! That sign was a great idea! People buy the FEELing, don’t you think so? give away or sell if the situation is like that. It is a huge liberation…. Jesus Christ!!! I didn’t know, of course…I’m so sorry to hear about it. So you were in the position to rebuild your HP collection, right? Exactly! This is also the way I perceive you, as a collector. And now I can reveal the secret, as long as my intention is useless. I was on the point to buy you a 32 SII, that’s why I asked you so pushy about it. It’s not very expensive in Romania, but it’s extremely difficult to find something like that. EXTREMELY! Anyway, I’m happy you have it. What’s strange for me is the date of the fire, august 2008. I was in Norway that time, but now I understand the impact of living among so many Swedish in Beitostolen. Almost everyday I used to watch TV4 (fra Sverige). BTW, Geir, how is Julius? Any interest in a small Casio Electronic Calculator, MG – 770 , 15 V x DC == 0.0081W. Made in Japan 137 (or B7) ? It also was a Game with notes. Measures 3 1/4 across by 2 inches and case. I used it to keep my mind alert back when. Sure, thanks. Mostly spend lots of time on the internet and computer. This June, I had a minor brain/eye incident which threw me for a loop. Finished a computer program of brain fitness exercises and did improve. The macular on one eye has now a scar which just inhibits some along with positional vertigo. All is well in practicing on the computer and it helps keep my mind alert. Oh, sorry to hear that! Be careful, too many hours of computer can damage you. Just be careful. Have a nice Sunday! Thanks, yes, I’m being very careful. Also forgot to note that it has given me a greater challenge to make things go right and I do have lots to accomplish. What site do you suggest that explains about computer hours can be damaging? Thanks for any info. I’ve leaned to blink every 20 minutes and also to look away to the distant for short periods. You know I’ve been so very healthy for my age and wondered what would get me, well , now have something to work with. hehe. Life is to be lived and enjoying what one enjoys, eh? Yup! Good girl! My 76 year old sister has returned to school brushing up her algebra and English, even recently got email, etc…. Holding back on living is always premature! 🙂 . I am inspired by her. You love that sweater, don’t you? It’s the same one you’re wearing in your sidebar photo, right? You’re right. The one of your avatar photo is darker. But you definitely love that sweater style. “I’m the operator with my pocket calculator (computing sounds)…”.